Forest owners, managers and policy-makers may remain unaware of the potential that the use of forest genetic resources offers for facilitating the adaptation of forests to climate change. We summarise the latest guidelines for foresters in England. A working group of European Forest Genetic Programme (EUFORGEN) recently considered the use and transfer of forest reproductive materials or FRM in the context of the challenges of climate change. They examined scientific research on provenance and adaptation, including several case studies of transfer, the existing regulatory framework and recent policy developments, guidelines on FRM transfer and their scientific basis, and future challenges and opportunities. Forestry Commission England asked the Forestry Horizons think-tank to consider this evidence and highlight practical information of importance to foresters. With the addition of specific geographic and policy advice the paper has been made particularly relevant to the forestry sector in England. 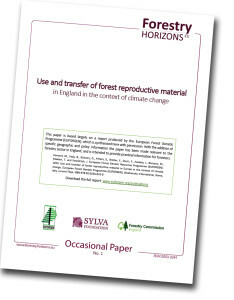 You can view the paper in the Forestry Horizons online library, where it can be downloaded for free.